WASHINGTON — The best movie in theaters right now isn’t a $250 million superhero tent-pole. It’s a $15 million sci-fi thriller, shot in just six weeks but sticking in your subconscious much longer. “Ex Machina” follows a young computer programmer named Caleb (Domhnall Gleeson), who wins a trip to a remote mountain retreat inhabited by a reclusive CEO named Nathan (Oscar Isaac). Upon his arrival, Caleb is asked to participate in an experiment involving the world’s first artificial intelligence in the form of a beautiful robot named Ava (Alicia Vikander). Speaking through the glass of the interrogation room, Caleb’s mission is to determine whether Ava actually has consciousness. Writer/director Alex Garland visited WTOP’s Glass Enclosed Nerve Center this week for a similar one-on-one chat behind the glass — but unlike the A.I. in his movie — he had the air of a Creator. “I like sci-fi because you can put big ideas in it and not be embarrassed,” Garland tells WTOP. While some filmmakers break into the industry by directing music videos, commercials or festival-winning shorts, Garland took a different path as a writer, penning the novel for Danny Boyle’s “The Beach” (2000), then writing the original screenplay for Boyle’s zombie flick “28 Days Later…” (2002). “It wasn’t so much working with Danny, it was the whole thing,” Garland says. In his directorial debut, Garland shows a keen eye for the cinematic language. In one particular scene, Caleb knows a secret that Nathan doesn’t as the two engage in a conversation. Garland starts wide, then punches in for a close-up the second the secret is threatened. Viewers — who are in on the secret — literally feel the frame closing in on Caleb. All the while, an ominous animal skull hangs on the wall, watching with omniscient eyes in symbolic mise-en-scene. In order to go with the flow, it’s vital to remember that film is a collaborative process. “Where I’ve felt I’ve watched people go wrong before … is not really recognizing the collaboration,” Garland says. The one exception came with the film’s special effects, which needed a precise blueprint. 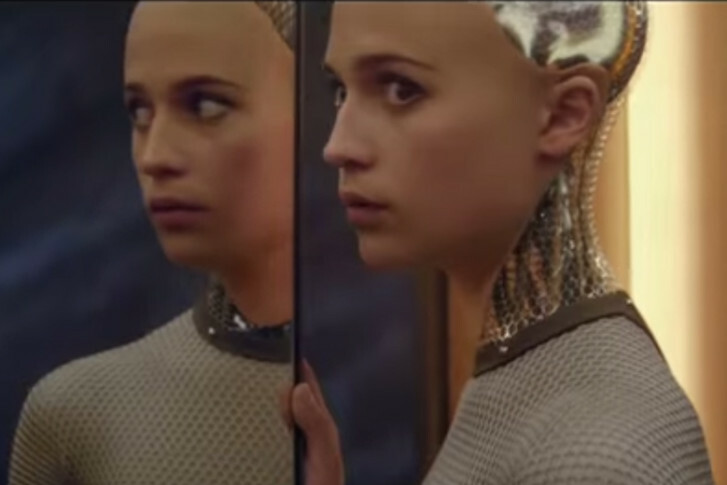 “Ex Machina” features zero green screen; zero tracking markers. Garland simply shot each scene with Ava wearing a grey mesh over her entire body. The visual effects team then swapped out parts of her body — neck, abdomen, forearms and lower legs — with a metallic CGI. Helping to sell the visual effects is the musical score, achieved with an instrument called a “celeste,” which creates an xylophone-style innocence à la “Close Encounters of the Third Kind” (1977). Of course, all the audio and visuals in the world wouldn’t matter if the performance didn’t absolutely convince you that you were watching a figure of artificial intelligence. Vikander is a revelation, offering a hint of Edith Scob’s identity crisis in “Eyes Without a Face” (1960), Sean Young’s lust-for-life in “Blade Runner” (1982) and Samantha Morton’s pre-cog victimization in “Minority Report” (2002). Garland knew he had to cast her after seeing her in a Danish movie called “A Royal Affair” (2012). At times, Isaac is harder to read that Vikander — and intentionally so. In an early scene, Nathan tells Caleb about the so-called Turing Test, named after Alan Turing of “The Imitation Game” (2014). Caleb says, “If a human doesn’t know he’s interacting with a computer, the test is passed.” Immediately, Garland cuts back to a shot of Nathan, making us wonder if he is an A.I. himself. Other times, Isaac displays very human impulses of libido. He makes sure to include sexual sensors between his robots’ legs. He drinks booze until he passes out. He punches a body bag with the fury of testosterone. And he seeks a sort of casual fraternity with Caleb based on “bro” humor. It all culminates in a bizarre dancing sequence to rival “Pulp Fiction” (1994). Contrary to release-date chronology, Isaac’s casting came independent of his acclaimed turns in the Coen Brothers’ “Inside Llewyn Davis” (2013), which Garland didn’t see until recently, and J.C. Chandor’s “A Most Violent Year” (2014), which shot after “Ex Machina” but hit theaters before. If acting streaks move in cycles, so do themes. Vikander’s female character comes off the heels of two other brilliant films dealing with women’s sexuality via technology: Spike Jonze’s “Her” (2013) and Jonathan Glazer’s “Under the Skin” (2014), both coincidentally starring Scarlett Johansson. Read that again. You’ll notice that Garland included “government agencies” in his analysis of our technological fears, which could shine light on which genre he tackles in future projects. While the genre gave us the investigative phrase “follow the money,” the era of the Hollywood Renaissance (1967-1980) was less obsessed with the bottom line, according to Garland. Indeed, on the set of “Ex Machina,” Garland often referred to Isaac as Colonel Kurtz being “too far up the river,” spitting homespun philosophy with god-like aspirations. This peaks during an important conversation, where Caleb quotes J. Robert Oppenheimer’s creation of the atomic bomb: “I am become death, The Shatterer of Worlds.” Nathan replies, “One day the A.I.s are going to look back on us the same way we look at fossil skeletons on the plains of Africa. An upright ape living in dust with crude language and tools, all set for extinction.” This is the end, my friend. If you liked the smell of napalm in the morning, you’ll love the scent of A.I. in the afternoon.